I don’t know which day of the week it is and I’ve lost track of the date. But it doesn’t matter when you’re so close to the equator that every humid day is the same in a cyclical heat wave. Despite this, everyone says that this is the perfect time of year to come to Bali. It’s the beginning of June – I’ve missed the wet season and it’s the mild beginning of the dry season. Yet within this steamy, dreamlike haze, Bali is undeniably vibrant and imperfect and wild and real. And the most real and imperfect place within the island is Kuta, the area near the airport that is home to golden beaches and trashy tourists and verdant, twisty streets that squirm through the city in a fantastic departure from the grid system. It’s down one of these narrow alleys that you’ll find the Bread & Jam hostel, named for the establishment’s daily breakfast of bread and exotic, homemade jam – papaya-lime, snakefruit, pineapple. 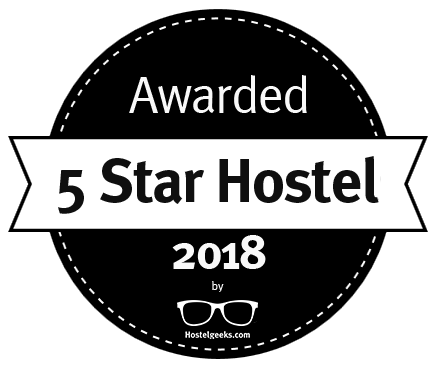 Bread & Jam Hostel is removed enough from the chaos of the beach and the main strip in Kuta that you can relax, but close enough that everything is easily accessible and all within walking distance. There’s a shortcut to the beach a few streets away that cuts behind hotels and, after a perilous street crossing, spits you out in front of the Discovery Mall, a shopping center where you can find about anything – from gourmet green tea donuts to brand-name clothing stores to delicate mango-shaped soap to sarongs. Exit the mall on the other side and the expanse of the Indian Ocean lies abruptly in front of you. bargain a good deal for a lesson and learn how to surf on the beginner-level Kuta waves. You can get a henna tattoo – but be careful, because the ink isn’t all-natural, and has been known to cause an allergic reaction. 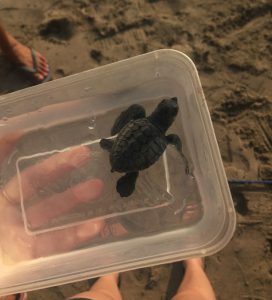 You can release a baby sea turtle into the ocean at the Bali Sea Turtle Society and watch it flail its way into the water, where it will have a thousandth chance of surviving the perils of the marine ecosystem. You can drink a Bintang beer for 25,000 Indonesian rupiah while watching the red sun sink quickly below the horizon. It gets dark fast here, and if you stay on the beach for a few minutes after sundown, you can glimpse bats hunting mosquitoes in the dusk and see the lights of the fishing boats stretch across the horizon into the black. If you want a night out, head to Sky Garden. Sky Garden advertises itself as the best nightclub in Indonesia – a subjective ranking that probably isn’t true, but it does the job in terms of sweaty, tourist-filled clubs where you can drink and dance and have a good time. They have a nightly promotion from 5 p.m. to 9 p.m. where you pay 99k to enter and have unlimited access to a buffet and drinks. Sky Garden is two kilometers away from Bread & Jam Hostel, but with Grab, a Southeast Asian ride-hailing app, you can order a taxi or motorbike for around 30k. “I did what anyone worthy of (sympathy) does: go live in Bali,” said Ben Dreyfuss, the editorial director of Mother Jones, in a sarcastic Tweet. And yes, there is something cliché about being here and going to the beach and eating tropical fruits and interacting with travelers who have spent months trekking across Asia, heartbroken or looking for something or escaping from orderly lives over the course of a summer vacation. We can’t avoid the fact that we’re all here, searching for the newest iteration of ourselves, hoping it’s better than the last.